Note: This post is now rendered obsolete following the announcement that Channel 4 will be taking over the BBC’s rights from 2016 onwards. A new post will be uploaded in due course. 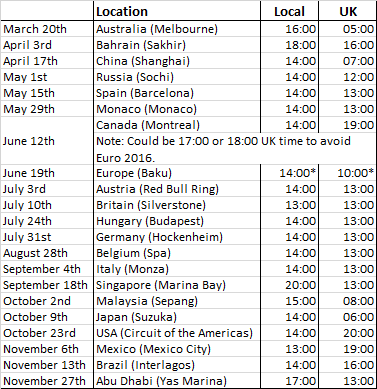 The 2016 Formula One calendar. This continues until every race has been picked. There are 21 races on the calendar, so BBC will screen ten races live with Sky screening eleven races exclusively live. We found out earlier this year that the picks do not change in the event of a race being dropped from the calendar. Even though Germany was dropped from the 2015 calendar, the picks stayed the same, meaning BBC were able to broadcast three races in a row live. There are a lot of different factors in the 2016 season, more so than usual, with the European Championships playing a part throughout the middle phase of the season. However, crucially, the Olympic Games does not clash with the Formula 1, which is a genius move. Again, this post is only for discussion and a bit of fun with the pick orders. My tally for 2015 of getting 11 out of 19 correct was slightly better than usual though, which is good! BBC pick Britain, Abu Dhabi and Brazil – Abu Dhabi and Britain are compulsory picks being the last race of the season and the home race respectively. From the BBC’s perspective, USA and Mexico run deep into primetime at a time of the year where they will have big programming, and Canada clashes with the opening weekend of Euro 2016, so again Brazil is the only option for their third pick in my view. What it does mean is that they definitely cannot pick Mexico, as they can’t have three live races in a row. Does the fact that the title race looks likely to be resolved earlier than usual change things? I don’t think so given that Mexico and USA run deeper into primetime than Brazil, and thus would disrupt BBC One’s schedule more. I’d expect to see Sky picking Canada, USA and Australia. It’s a tie between Australia and Monaco really, but the season opener is still a big deal in the eyes of Sky. BBC could in theory pick Australia instead of Brazil, but they haven’t picked Australia since this deal began, and I don’t see that changing. There might have been more chance of BBC picking Australia had it stayed in April, but not now. Ridiculously, the British Grand Prix now falls on the same day as not only the Wimbledon final (meaning demotion to BBC Two) but also with the final of Euro 2016. Mexico and Monaco I would expect to be on BBC’s and Sky’s agenda early, a primetime race and a prestigious race. Bahrain too has to figure somewhere, arguably its positioning makes it a great pick for BBC. I can see BBC picking Bahrain, and as discussed earlier, Sky pick Mexico. In reality, Mexico would probably be left until the end given that BBC have already gone for the last two places, but I’m trying to do it blocks so the post does not get too confusing. Mexico takes priority over Monaco because it could be a championship decider. Normally, at this stage, I’d work down from start to finish, but Euro 2016 complicates matters. For that reason, I think we will see BBC pick Monaco and Sky pick Italy. It is unusual for me to label Monaco as pick nine, but I do think BBC will consider Bahrain high priority, whilst the addition of Mexico bumps it further down the order. BBC are certainly not going to jump for any race that clashes indirectly or directly with Euro 2016. Sky probably would want some exclusive live F1 content during the Summer next year, but it certainly won’t be at the sacrifice of screening either USA or Mexico exclusively live, for example. Following that, BBC pick Germany, Sky pick Belgium, BBC pick Singapore and Sky pick Malaysia. Lastly in this set, BBC pick Russia and Sky pick Spain. Spain does clash with the end of the Premier League season though, which is worth bearing in mind. We’re left with China, Baku, Austria, Hungary and Japan. BBC cannot pick China or Hungary, Sky cannot pick Japan, otherwise they would be showing three races in a row live, which they cannot do unless something drops out. At this stage, it is between Baku and Austria. It is assumed that Baku will clash with the final few hours of the 24 Hours of Le Mans but not the end of the race. Austria clashes with the London ePrix, but it is not a direct clash – the ePrix starts at 16:00 UK time, although there will be personnel clashes. I think BBC pick Austria as it forms a double-header with Britain. Sky pick Baku, BBC pick Japan and Sky pick both China and Hungary. I don’t think we will know the actual picks until the New Year, as the Euro 2016 draw does not take place until December. Either way, this is an initial guess at how things will transpire. Updated on October 18th, 2015. I think that you are very close, but I am uncertain about a few of your choices. I think that they’d prefer Belgium over Hungary – even if it is affected by Euro 2016. I understand that the Olympics and Euro 2016 will affect certain Grands Prix but the BBC will be looking for ratings to annoy Sky Sports. I also believe to gain more ratings that 2 hour highlights packages will return for American timezine races and they should avoid Europe because it will be a 2 hour highlights package from around 1pm and the Golf Open is usually shown on BBC2 not BBC1 on a Sunday due to other commitments. Just to reiterate, the BBC could drop the Open Golf after this year so highlighting the European GP would not affect this. Also, would prefer Germany or Hungary over a rcae that starts at 10am UK time. Hang on if there picks are effected by the euros. What would have happened if bbc still had all the races live? The Grand Prix would move to BBC2. Sorry I don’t understand why sky pick USA and Canada first over Monaco. Surely they would pick Australia, Monaco and another? USA and Canada are in Primetime so in theory should gain more viewers than the Monaco GP which starts at 1pm. Is the prestige and marketing value of Monaco not more important? What are people’s thoughts about the new proposed calendar. I think the only way it can be resolved is have Malaysia, Japan, then Singapore before the US races. Also the biggest mistake is both MotoGP and F1 races have fell on the same day, so Icm can see Malaysia moving to September 25th. With the new calendar, i would change mine around a bit. The BBC have the first 3 picks, so i would think they would go for Britain, and Abu Dhabi, for obvious reasons, then they would go for Canada. Sky would then go for Monaco and Australia (again for obvious reasons), and then I think they’d go for Brazil. Now the broadcasters can only pick one each at a time. BBC have the first pick, so they would go for Belgium. Sky retaliate and go for Italy. BBC would then go for Bahrain, and Sky would grab the US GP. BBC would grab Hungary, and Sky, Germany. BBC would then go for Malaysia, and Sky, as they can’t pick Mexico as they cannot broadcast 3 races running, would choose Singapore. BBC would then choose Russia, and Sky, Austria. BBC would then choose Mexico, and Sky, Japan. BBC go on to pick Spain, leaving Sky with China and Europe. But personally, i don’t like the layout of the Calendar anyways. The 2016 Calendar has been confirmed with question marks over the US GP. The Mexican GP moves forward a week twinned with USA again (now 30th October) and Baku will be scheduled to avoid conflict with the closing stages of the Le Mans 24. Now the Euro 2016 picks have been confirmed, we should get an anwser soon. Looking back at your prediction you are very close. I think that BBC will pick Belgium over Germany and that the BBC could pick Austria but may prefer Baku so there aren’t any personel clashes. Canada should be a no-no but as stated before under previous contracts, the race would be moved to BBC2 or have the Start time changed, which happened in 2004, ITV had a Football clash so Canadian officials moved the start time and the post race programme was moved to ITV4.